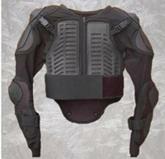 The Combat zone is the areas number 1 supplier of combat armor to the general public. We also store items in bulk for private security needs. 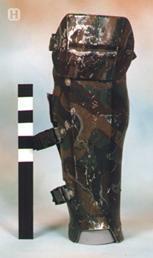 This armor was designed for one purpose, to be worn by personnel firing fixed weapons. Because it doesn't allow full range of motion on the arms, it isn't very popular at all. It's also very heavy, another factor that doesn't do much for its sales. Still, if it's your job to man the turret on a tank, or the door gun on an AV or chopper, it's hard to beat the protection this armor offers. 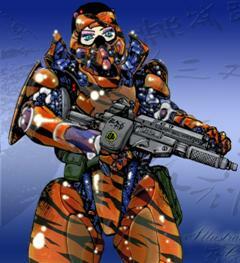 This light armor is one of Arasaka's most popular designs, and sells well to private security forces. 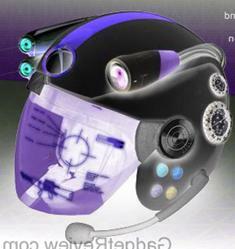 The helmet is fully equipped to install up to 4 cyberoptic options. Arasaka's attempt at recreating the Gasium K-5. It doesn't offer as much protection, and does hinder movement very slightly. But if you budget doesn't allow for Gasium, this is the next best thing. 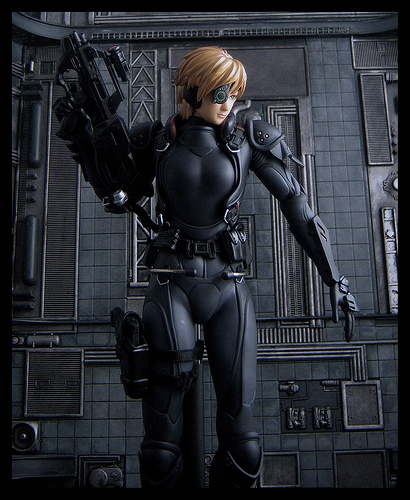 This heavy armor from Arasaka offers more protection that standard Metal Gear. 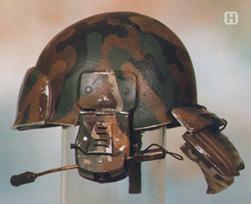 The helmet is equipped with Low Light, Anti-Dazzle, UV, and a military radio communicator. A lighter, albeit bulkier version of metal gear, this slightly powered personal armor has a REF bonus of +1 and an SP of 25. Used for fast assaults into high risk situations by E-SWAT, it is specially made for maneuverability and stealth. 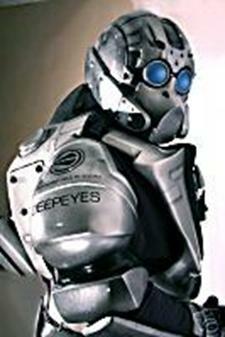 It too utilizes the data film for transmitting the physical signals too the suit. 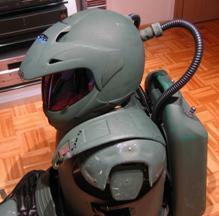 Orc suits can monitor acoustic signatures, or A/S, giving them an awareness bonus of plus +2. The system is also designed to monitor their comrades for the sound of breaking armor, giving them a better teamwork ratio in stealth operations. 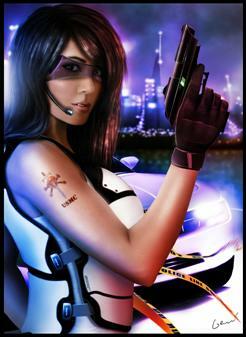 The helmet is equipped with; auditory boost, low light enhancement, image enhancement, and tele-optics. The suit also boosts the BOD and MA of the user with a bonus of +4 each. 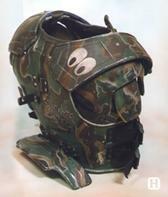 Provides full protectionfor the torso as well as shoulders, and the collar is armored to act as a gorget. 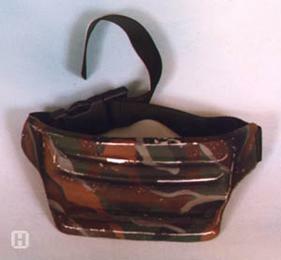 This armor incorporates a unique strap design for attaching the shoulder padding, the heat dispersal pads, and various other pouches and accessories, the standard configuration consists of 4 pouches plus 2 grenade loops, though other variations are common, and back straps are present and functional for even more specialization.. Protective gauntlets (SP: 10) for the forearms, these protect from both bullet and knife, and are effective in riot situations as well as being covered in the same heat dispersal panels as the vest and pants. 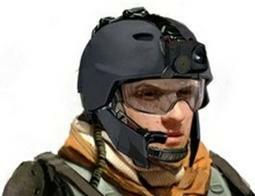 This helmet(SP: 20) features a full faceplate equipped with anti-dazzle, low light, thermoptics, Ultraviolet, Times Square, and targeting scope, the helmet also has a built in radio and lasercomm. Finally the helmet is self sealing and acts as a gasmask. The goggles are actually high tech binoculars (treat as teleoptics with x4 range). Like the uniform and armor, the color of both helmet and faceplate varies, from standard blue and silver, to high visibility gold and red, to helmets in more stealthy colors or camo with non reflective visors for covert or field operations. At the touch of a button this shield expands from the size of a small panel to a full riot shield, protecting the user even from most small arms fire (SP:25), and the shield is transparent so you never lose sight of your target when you are taking cover. 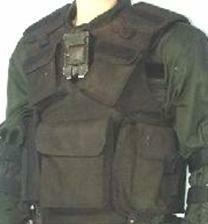 Instead of straps, this armored vest has customizable pocket arrangements to more securely store your gear, or if one is inclined, one can simply use the pockets for thick Kevlar pad inserts (SP:20 10% chance bullets misses inserts, additional ten percent chance for every pocket used to store gear instead of armor.) The pockets vary in size, allowing a perfectly tailored custom load out every time. A bit of added protection. 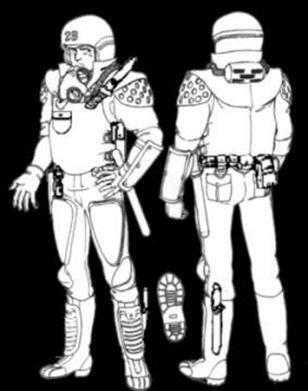 This armor is designed by Arasaka to be all purpose, and so Uniformed officers, Swat, and C-SWAT are all issued the same vests and helmets with minor variations in color to differentiate them. Normal uniformed duty officers wear Blue Jumpsuits with white vests and helmets. SWAT officer uniforms vary in that they wear Black jumpsuits with gray vests and helmets, and C-SWAT personnel wear gray jumpsuits and blue armored vests and helmets. 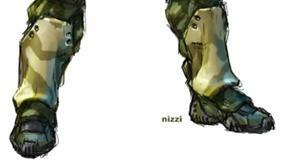 In addition, there are armored coverings for the forearms, shoulders, thigh's, knee's and boots (SP:10, 25eb each). As well as hard inserts for the vest (SP 5 and gives the vest an EV 1, 15eb). These addition armor plates and inserts will have the same coloration as the officers issued uniform colors depending on duty. 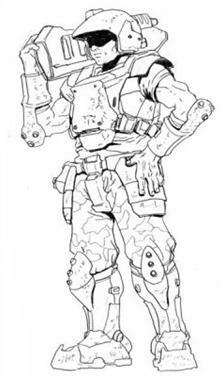 This heavy armor consists of a heavy flack vest (SP:30, EV 2, 500eb), reinforced arm gauntlets (SP:15), woven Kevlar pants (SP 18, EV 1(550eb), armored boots (SP 12, 350), a more streamlined helmet (so bottles and the like bounce off instead of smashing full force) (SP 25, 120eb), and a better gas mask/filter (235eb). 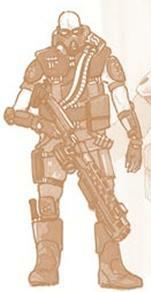 This armor is very heavy, and while it offers excellent protection, it severely limits mobility. Useful only for Riots, although the bomb squad seems to have taken a shine to them too. 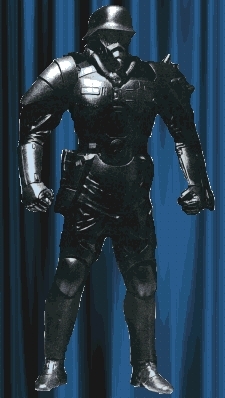 These suits also feature a glowing blue bar with extends from the shoulder, this make the officers wearing the suit easier to spot in a crowd. The standard black jumpsuit is worn underneath. This armor is used only for extremely hazardous situations. With C-SWAT getting the most out of it. It is standard metal gear (SP 25 EV 2) and makes for an intimidating sight. 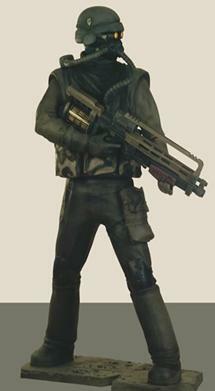 The jumpsuit is worm underneath, but absolutely no addition armor can be worn under the metal gear. The helmet features the basic visual package (LL, AD,), and the basic helmet radio. Please note that metal gear is to be used only in emergency situations, as its appearance has been known to cause public relations nightmares. The public doesn't like seeing its officers in metal gear, as it implies something nasty is happening, which can lead to public mistrust and or apprehension of the police. a datasuit must be worn underneath. This uniform is skin tight, and nothing can be worn above or beneath it (except underwear) to operate properly. The police version, its marking not withstanding is functionally exactly the same as its civilian and military versions. 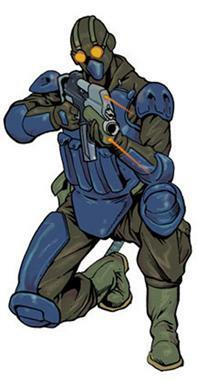 For heavy weapons specialists, the ICMF makes use of the second South American War U.S. issued flack armor. 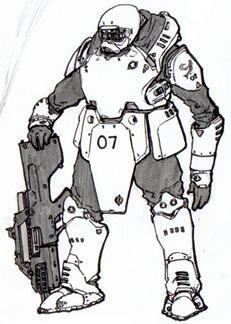 It consists of heavy plate body armor with shoulder pads, and a built in gyro-stabilization mount. 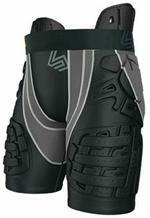 Heavy Kevlar skirting completes the armor, to protect the upper portion of the wearers legs and groin. 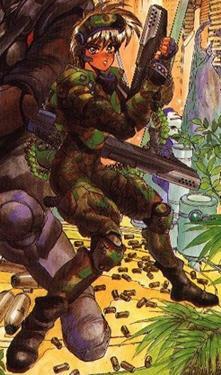 This suit, issued to U.S. special forces during the Second South American War was the precursor to modern metal gear. Unlike the metal gear of today, which most often consists of layered crabshell hard armor plates, the AAW-5 was made up of form fitting semi-rigid plates and softer Kevlar pieces all woven into a flexible bodysuit. The suit has built in adjustable holsters and gear attachment points, ad the helmet features a radio and built in anti-dazzle. ICMF forces still have plenty of these suits, which were left behind when the US pulled out of South America. A knock off-of the popular US Military issue breastplate. Plain clothes detectives, make the most use of this armor, though undercover and even informants may on occasion make use of it as well. 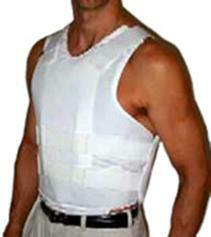 It is a light and extremely flexible ballistic vest providing protection to the vital organs. It is rated at SP:12, though it has pockets for a hard armor inserts that boost the armor rating up toSP:18. While the plates restrict movement somewhat (EV-1) with or without them the vest is virtually invisible to the untrained eye (diff: 22 to spot) and is available in both male and female versions in either white or black. Comfortable layered Arachne-silk over thin segments of Kevlar. (200eb). However the benefits of light weight and covert hard armor protection are more than worth the cost. 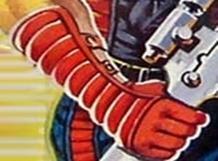 These gauntlets offer hard protection for your forearm elbow and the back of your hand, and for added defense a high powered taser is built into the gauntlet just above the wrist. Similar to the Scorpion Gauntlets, these forearm protectors contain an aerosol sprayer that can be loaded with a variety of substances, from tears gas or pepper spray, to acid, or even drugs. Flexible armor for personnel in a support role. It leaves a lot of important areas uncovered, but its light and doesn’t restrict movement at all. 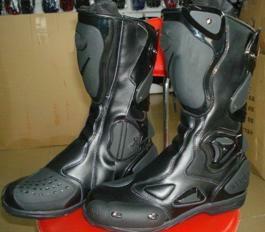 A very durable suit of Metal Gear style armor, head to toe protection that outperforms the competition. This armor is little more than a Kevlar vest, flexible enough to be comfortable while capable of stopping most small arms fire. 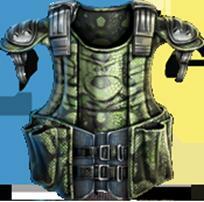 The vest is equipped with straps and pouches for securing any gear the soldier might carry. This is basically a heavy Kevlar scarf worn on the shoulders. It doesn't protect from strangulation , though it does protect from small arms fire, and allows the gasmask to rest comfortably from it when not being worn. A Kevlar composite helmet with a short range radio installed, with the microphone built into the gas mask and the speakers built into the inside of the helmet. Included with the helmet are Smart Goggles equipped with Low-Light, Thermograph, and Anti-Dazzle. The gas mask is also standard issue, it is attached to the filter unit mounted on the shoulder, or to an independent 20 minute air supply worn on the right hip. The soldier may switch between the two options as need arises. 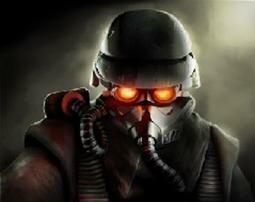 The gas mask also provides SP: 10 facial armor. Equivalent in function to the American version but much heavier and offering of more protection. 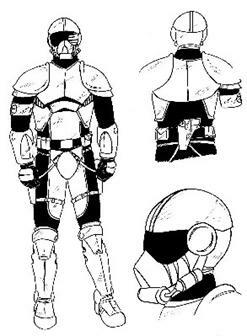 The front portion consists of heavy plate armor with a large collar and shoulder pads. Unfortunately the armor only has a light, flexible Kevlar pad (SP:12) in the back, definitely a weak spot, but since the Chinese military commanders look down on retreat, they don't worry about it much. Preferred by special forces over the bulky standard armor, this light weight composite plate armor consists of chest plate (SP: 16, 200eb) shoulder arm and shin plates (SP: 12, 10eb apiece). 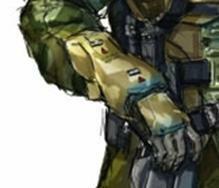 It allows the soldier wearing it to move faster, and creates less of a profile than the heavier standard armor. Absolutely no frills is the best description for this Chinese armor. The hard plates are worn over a soft ballistic weave (SP: 6) and the helmet comes equipped with Infra red, thermograph, and anti dazzle, as well as a short range radio. 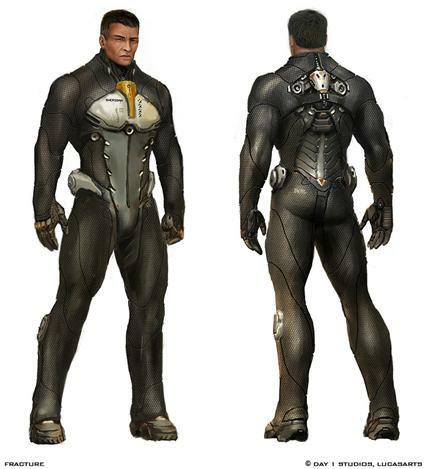 The suit is extremely light wieght, mostly due to its sparse (for metal gear) protection, and can be warn comfortably longer than it's US or EDF counterparts. 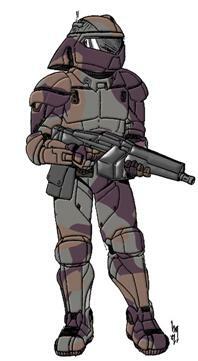 Light rigid combat armor, very popular with European and Asian police forces. This heavy armor is similar to the standard Columbian armor, though much more effective. 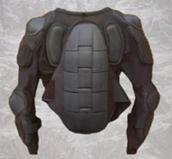 It consists of a heavier vest (SP:20, 450eb) an armored shoulder pad (SP:15, 20eb), and leg and arm pads (SP: 12, 25eb each). A stylish, sleek, and lightweight leather and kevlar jacket, popular with motorcyclists and nomads because it offers as much protection from the road as it does from combat. Molded Kevlar and steel, available in a range of styles. Similar elbow/forearm armor is also available for 250eb. 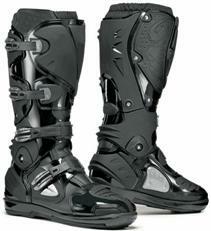 Armored boots in a variety of styles from the company that seems to make their products for both motorcycle riders and combat pros. This helmet was designed specifically for war war correspondents and other photographers or reporters in high conflict areas. It has 2 cameras that can record simultaneously, each equipped with tele-optics, low-light, UV, and image enhancement. 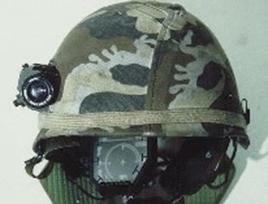 A headlamp capable of normal or UV light emission as well as an audio recorder/radio transmitter with satellite link are also built into the helmet. The visor has the same options the cameras do, as well as times square marquee that will display the images/video being recorded. The cameras each feed in to a separate easily changed recording chips (6hr’s each), and the onboard microcomputer allows for editing on the fly. Audio will record to either chip, neither, or both. 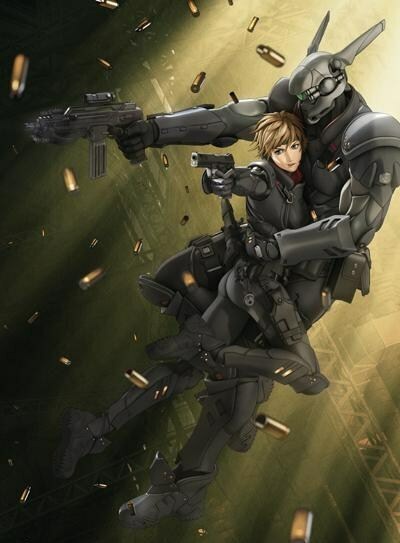 The flexible, highly durable armored vest used by all EDF forces. Very light but offers no arm or groin protection. 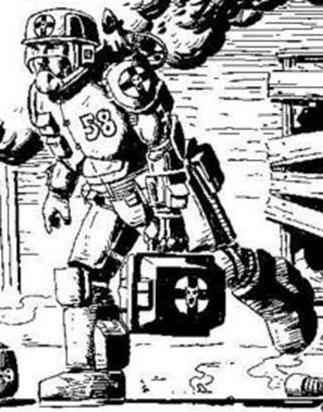 For added mobility the armor is modular, with shoulder pads, breastplate and mid-section wrap, and back plate. A very lightweight combat helmet, it is even semi flexible. A short range radio is installed in the helmet, with the microphone built into the chin strap and the speakers built into the inside of the helmet. 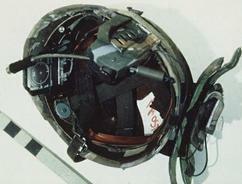 A flip down visor is standard equipped with AD, IR, and LL. heavier than the U.S. counterpart, but offering better protection, and protects the entire neck, not just the front. 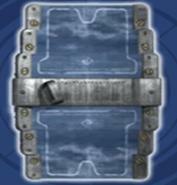 Used solely for guarding highly secure areas and for extremely heavy combat situations, as it is too heavy for prolonged wear. 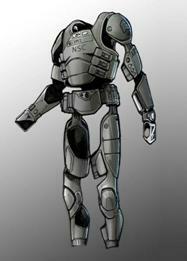 The armors appearance varies depending on branch of service. 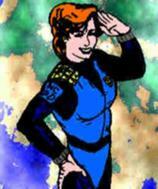 Customization is common, however most officers suits are more elaborately customized than others. 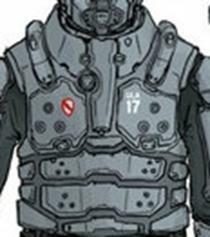 Suits will also be outfitted according to their use, such as the Navy's scuba armor, and the arctic and desert survival armor. There is even space armor for use by the Air Force. 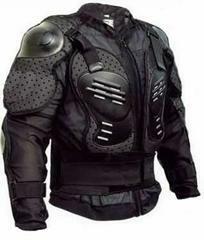 All suits are equipped with a cooling/heating system with a 3 hour battery and 3 hour air supply. 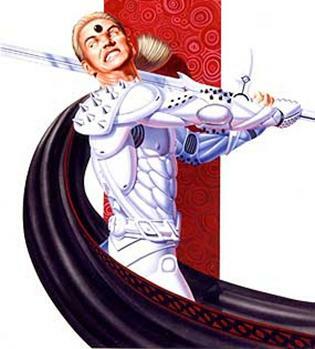 The styling of the armor reflects European ego. 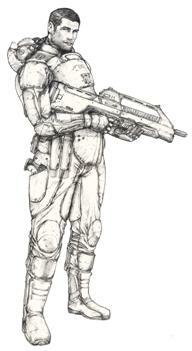 The European heavy combat armor. It is basically metal gear with a few extras.. It provides SP:25 armor, comes with a helmet and removable face mask that functions as a gas mask with a built in person radio, therm optics, anti dazzle, Times square option and low light. 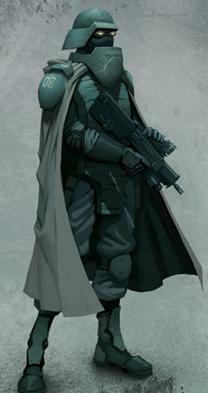 the jumpsuit worn underneath is armored to SP: 6 and if the full version is worn, including powered leg units (allowing the soldier to make leaps up 15 feet and 10 feet high) the soldier wearing this is almost unstoppable. 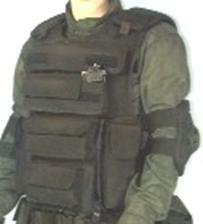 A very inexpensive armor vest made of semi-rid plates over kevlar, particularly for its protection rating. 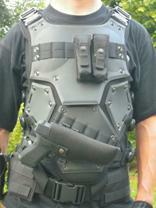 Very similar in design and function to the American standard issue Body Armor. The GR-4 armor vest is a soft armor vest with Hard-shell plates attached directly protecting the chest, shoulders, spine, and abdomen. The adjusting straps serve as an attachment point for additional equipment pouches, ammo, gear, or holsters. 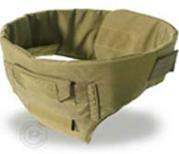 Knee And Shoulder Pads- (SP: 8, 45eb) Affix directly to the BDU's via special clasps. 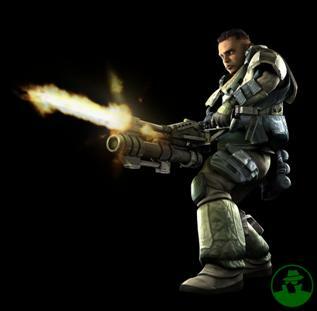 Additional Armor Add-Ons- for increased protection under heavy fire, a soldier may opt to wear the issued hard armor plates protecting the thighs and lower legs, as well as gauntlets protecting the forearm and elbows. Fully enclosed with an armored faceplate, the visor is equipped with LL, Thermograph, and tele-optics and a built in short range radio completes the helmet. A very advanced and highly sought after piece of equipment, the Argentinean version of Advanced Metal gear is easily comparable to Arasaka's ORC suit. Not quite as highly armored, but much less bulky. The GR-8 is so impressive, that Mossad has placed a large order for them. In addition to boosting strength and speed, the suit's helmet is equipped with radio/laser comm, Level Damper, Thermograph, Low-Light, Image Enhancement, Times Square Marquee, Tele-Optics and Anti-Dazzle. PBA-5 Additional Armor 25eb each (SP: 12) Additional armor plates, worn at the thighs, and shoulders as well as gauntlets and shin guards, complete the basic armor ensemble. 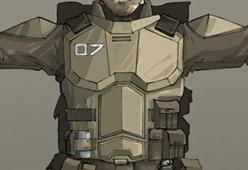 These replace the need for a seperate suit of metal gear, as a soldier can armor himself up to equivalent protection. Sadly, there in no groin protection in any variation, another reason the system was abandoned by the EDF. Fully enclosed with an optional armored faceplate/gasmask, the drop down visor is equipped with LL, Thermograph, and tele-optics and a built in short range radio completes the helmet. Less protection than Metal Gear, but infinitely more comfortable. Essentially just a triple layered Datafilm with a little extra padding around the vital areas. The market is very slim for these suits, mostly due to price, which must be hand made and custom fitted to each individual. 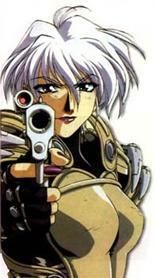 While they seem a bit ridiculous in their advertisements, Malorian guarantees they are 100% combat effective. 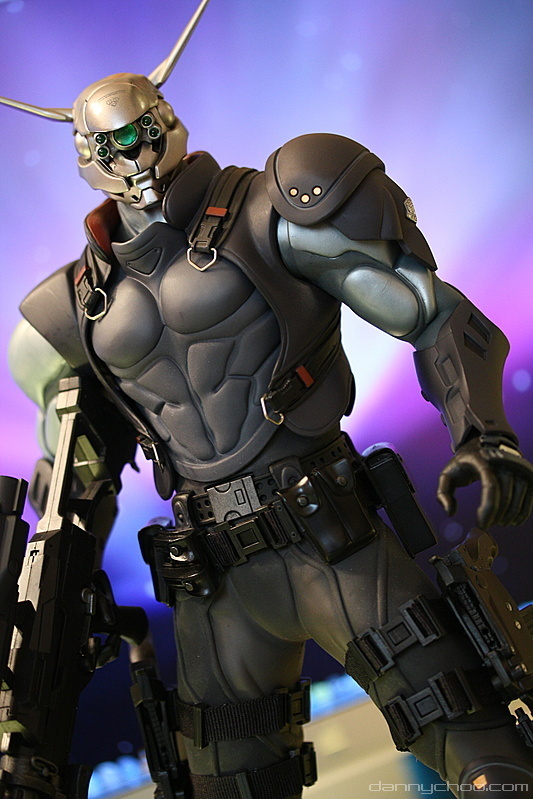 The original design was created when Kerry Eurodyne contacted Malour about outfitting his bodyguards with a more aesthetically pleasing version of Metal Gear. 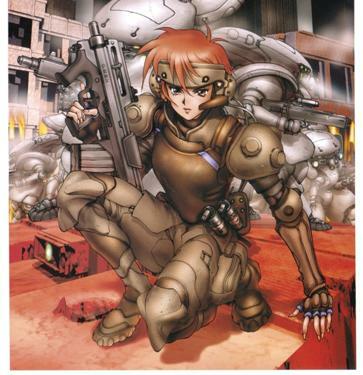 (SP:25) (EV:1) (STR:+3) An early and slightly inferior equivalent of HAL-05 metal gear plus from Militech, this armor is very rugged, and stands up well to rough wear and abuse. It gives the wearer a slight boost to strength, and allows him to stand up to even the most brutal opposition. Made by an Australian company and rumored to have been supplied by the EDF, these are most often used by ICMF special forces type groups, or in cases of heavy defense positions. 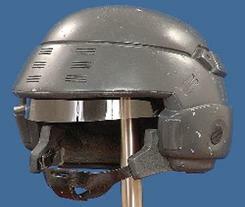 The helmet features built in radio, Thermograph, Low-Light, Anti-Dazzle, Smart link, and Level Dampener. 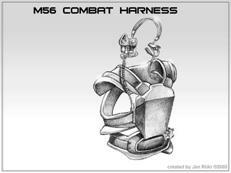 The suit also features several attachment points for a large variety of equipment pouches, ammunition storage, and weapon holsters. 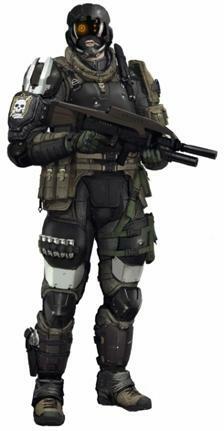 This suit of metal gear plus is the heaviest in standard use of any military in the world. It is not as agile as or as strong as some it's counterparts in the EEC, Russian, or American militaries, but its protection is incomparable. 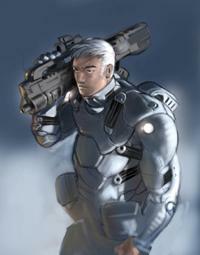 The suit provides the wearer with a strength boost which helps alleviate the stress of the weight of the suit itself, though its size still adds greatly to the encumbrance of the armor. The cloth portions of the armor are actually thick Armorweave (SP: 8) draped over a strength boosting frame. 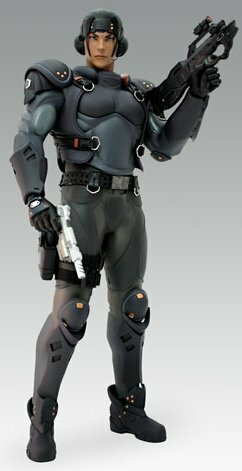 Just shy of hardsuit classification, this suit features a 30 minute independent air-supply, a cooling system made necessary by Mexican climate, and the helmet is equipped with IR, Anti Dazzle, Low-Light, audio dampers, and a military radio/laser communicator. Additional accessories include a gyro-stabilization harness and back mounted ammo hopper (200 rounds) for heavy gunner duty, and disposable self inflating flotation units for naval duty. Mexican Metals is hard at work on an advanced model that reduces the encumbrance by over half while still retaining full protection and strength boost. Sold as a set, this armor includes a hard armor clamshell breast plate with high collar and shoulder pads, kneepads, gauntlets, elbow pads, groin and abdomen protector, armored boots, and a helmet (all SP:20). 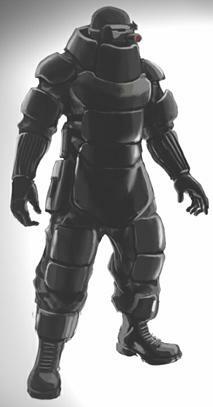 This version of the Standard Combat Armor produced for the US Military is specifically designed for special forces. So far only the Army and Air Force special forces have officially adopted it. 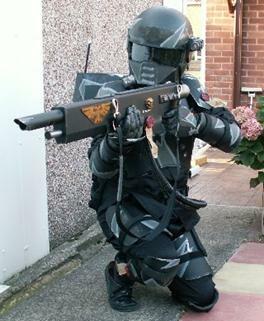 Since the SEALS wouldn't go for the original Commando armor, Militech took their suggestions and went back to the drawing board. This is what the came up with and is currently being tested by selected SEAL teams serving in Africa and Southeast Asia. 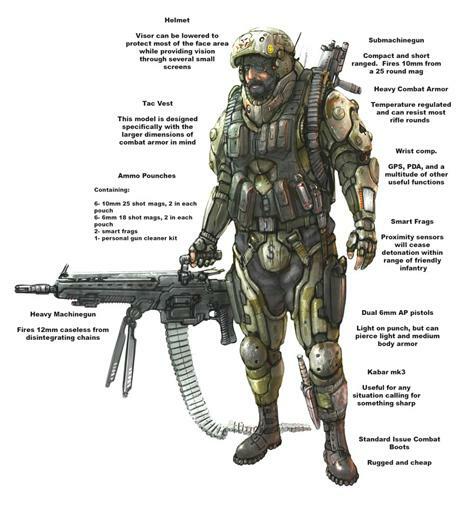 Bomb Disposal Armor, this armor has the highest protection rating you can get on personal armor without involving a powered frame. The helmet is equipped with Tight Beam Laser Communicator, Flashlight, Tele-optics, Therm-optics, Image Enhancement, and Micro-optics. This heavy armor is a budget alternative to metal gear for heavy assault situations. 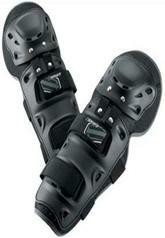 It is customizable upon request and offers fantastic protection for most of the body. 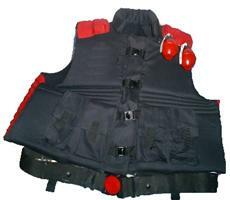 This vest is slightly flexible and protects the torso of the wearer from most small arms fire, it is also highly modifiable due to the straps running across it, allowing it's loadout to be customized to the wearers exact needs. 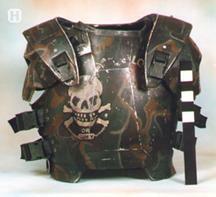 It features optional shoulder pads, optional belt brace for heavy loads, and additional armor plates (SP:8 EV-2) can be added instead of equipment pouches. Protects the soldiers groin, while somewhat uncomfortable, this is perhaps the most popular piece of armor among the soldiers, after all it protects the soldiers favorite peace of equipment. An armor plate gorget that protects the wearers throat, won't do much against most bullets, but will some protection is better than none, and will prevent garrote attacks effectively. 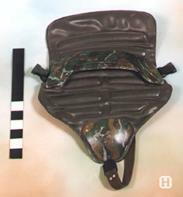 Primarily used in conjunction with the 2nd South Am War U.S. style BDU's supplied by Militech, this plated body armor is very close in design and function to the M-3 armor currently used by United States forces. It was introduced late in the 2nd South Am conflict and is a common sight with ICMF forces. 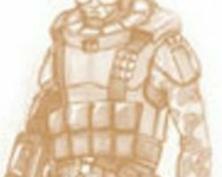 Unfortunately the armor can get a bit hot and uncomfortable, and most soldiers prefer the softer M-1 armor vests. (SP: 18) Again, like the M-1 armor, this helmet was issued to U.S. forces during the Second South American War, and is still the most common headgear in use among ICMF personnel. It features attachment points for any standard (1995-2015) era night vision goggles, built in radio, and flip down visor with anti-dazzle coating and an inner flip down monocle with times square marquee. A slightly lighter, more flexible version of Metal Gear. 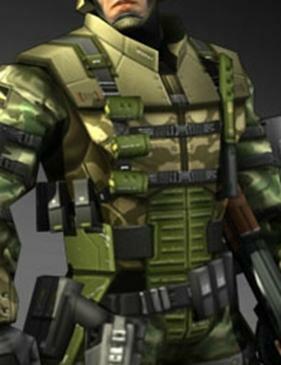 The very first suit of metal gear ever produced, and issued in large numbers to United States Troops during the Second South American War. Large, bulky, and hot, it nevertheless afforded excellent protection. It was particularly effective in the Andes Mountains and in Operation: Blind Faith. 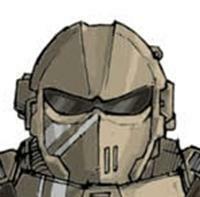 This armor is still widely in use by the ICMF as the surplus for the suit is immense, plus it is just one more symbol of the abandonment. The helmet is equipped with a radio and a flip down visor with Ultra-Violet, and anti-dazzle. 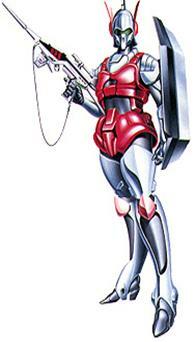 he ARM-7 combat exosuit uses the same Strength Enhancing power frame as the HAL-O5 suit. 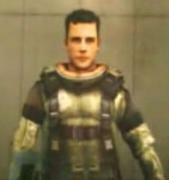 By eliminating the heavier armor in favor of a thinner shell, and not bothering to completely enclose the wearer, the ARM-7 suit can be worn over its users normal clothes and provide him with an even greater strength boost than the HAL-05 armor (+6) due to the suit having less base weight. This latest breed of exoskeleton is a far cry from the old bulky models of the past. 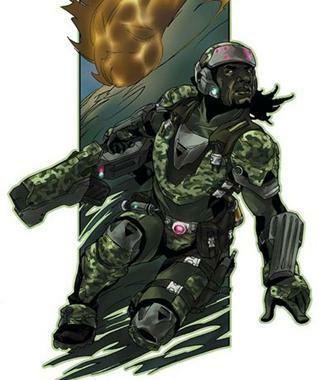 And while the wearer may not be as protected as the heavier HALO-5 suit, his strength boost more than makes up for it. (SP:25) (EV:2) (STR:+5) Like most things in the U.S. military, the US standard issue Metal Gear is much more utilitarian and functional than it's European counterpart. The same suit is worn by all branches of the U.S. military, so any additional options are easy to install, such as thrust units for E.V. duty or swimmer options for underwater operations. As standard the suit is air tight, able to withstand depths of up to 500 feet, and is equipped with its own cooling/heating system with 4 hour battery. 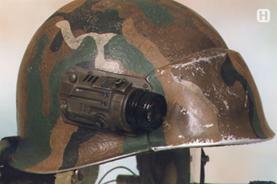 The helmet features full optics suite with (IR, Thermograph, Targeting Scope, Low Light, and Anti-Dazzle). 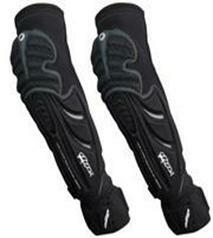 Protects the wearers legs, not very comfortable, but every bit of protection helps. Adjustable retracting monocle equipped with LL, Thermograph, and tele-optics and a built in short range radio. 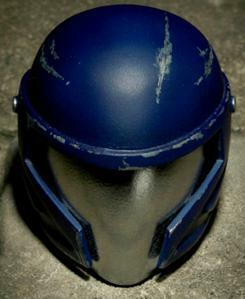 Similar, though inferior, to Militechs latest infantry helmet. The advanced version is a little more sloped, and has a built in camera and flash/laser light. 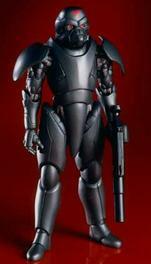 This flexible but highly durable armored body suit was created with Meticulously layered datafilm. It provides neck to toe protection in a design so thin and comfortable it can be worn under most clothes while being nearly as effective as Metal Gear. 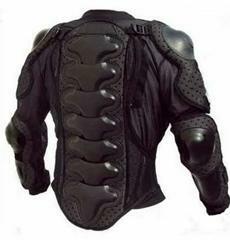 It also interweaves state of the art advanced muscle fibers into the suit, increasing the users strength and speed. 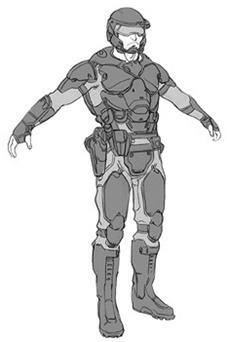 An armored body suit usually custom compartmentalized for the wearer's specific needs (sown in holsters for specific weapons and pockets etc...). 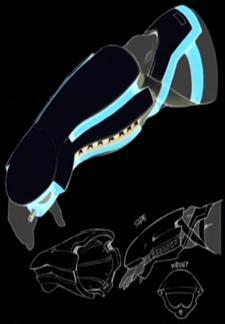 The K-5 is made to be worn with a datasuit underneath. Despite its bulk this suit is incredibly light and has no encumbrance penalty. 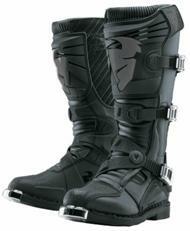 It offers an SP of 18 from head to toe and is covered with a special rubberized coating to prevent clash and clatter. The suit will be custom fitted and compartmentalized to whatever the wearer's demands may be. This armor has become so popular that Poseidon has begun manufacturing it in a wide variety of colors and variations designed to suit any need. From urban to jungle to desert to arctic conditions this is the best armor on the market in terms of protection, comfort, and range of motion. 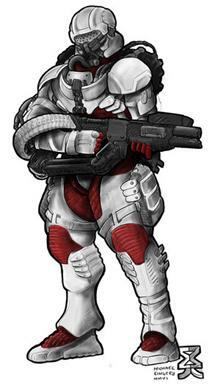 A lighter, more agile version of the Gasium K-5 battlesuit. They even make it in sizes large enough to fit normally proportioned and shaped full conversions. This set of battle armor is only sold as a whole, it consists of helmet, adjustable torso clamshell armor with should and upper arm plates, belt with groin protection, thigh and knee pads, boots, and gauntlets (all rated SP:18). Accessories include holsters, pouches, and sheathes, and the helmet comes with built in radio, with space for 4 optic options for the visor. 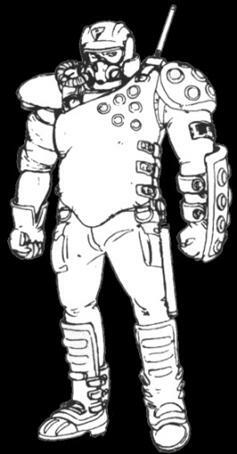 The suit is adjustable, and when done correctly to fit the user, it fits like a glove (no EV penalty). 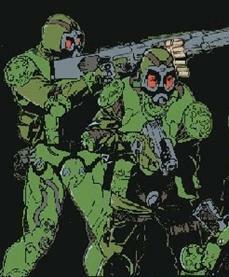 This is the heavy combat Metal Gear supplied to Eastern European military forces and police. It is heavy, but offers more protection than it's standard US counterpart. The helmet comes equipped with short range radio, IR, AD, HUD, and enhanced audio pickup. 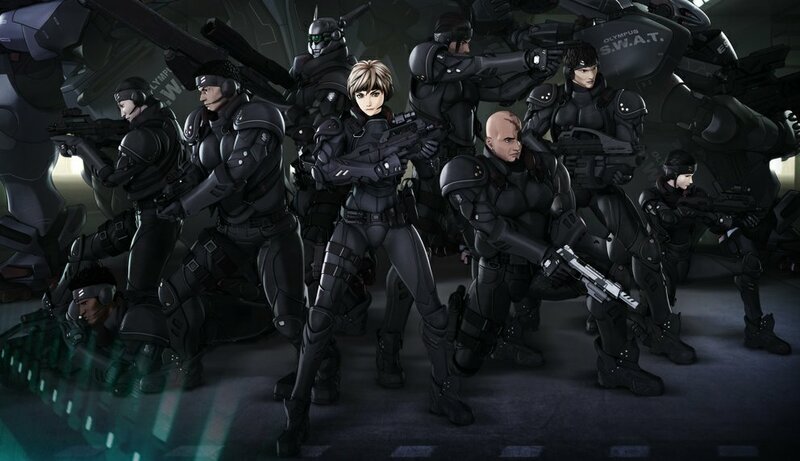 Supplied by Russia, these older suits of slightly powered metal gear aren't quite as powerful as the new Russian Deep Eyes suits, the Arasaka Orcs, or the Militech HAL-O5 suits, but they should not be underestimated. The boost the wearers strength (+2) and speed (+2) and provide all over protection (SP:22) with little negative effect to the wearers agility (EV-2). Russians utilize their advanced Metal Gear perhaps more than any other military on the planet. 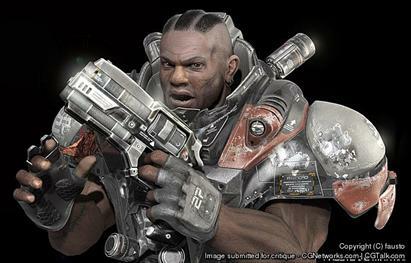 Comparable to the Arasaka ORC suits, or the Militech HAL-O5 armor, but offering even more protection this armor is heavy and cumbersome, but extremely effective. It also features a built in heater, to keep hypothermia from setting in during the cold Russian winters, and an AC unit (tech stolen from the EDF metal Gear) to keep their soldiers from killing themselves in the grueling heat of the deserts or jungles of the world. The helmet features Short Range Radio complete with level dampener, and the optics include Smart Link, Times Square, Ultraviolet, Thermoptics, Anti-Dazzle, and Tele-optics. 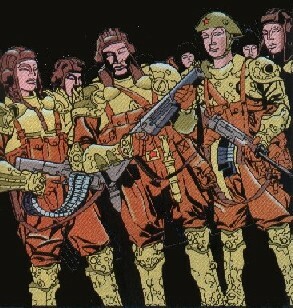 The standard infantry (shown left) and Special Forces(shown right) version vary slightly in appearance. There is an advanced version in development, that offers true interface (dropping the EV to 0), thermal dampening, and boosts the wearers running speed (MA+2 35,000eb). 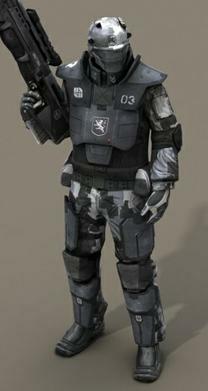 Hard-shell body armor (SP:22), semi rigid leggings (SP:18), elbow pads (SP:8) and a high tech helmet (SP:25). The helmet features built in radio, laser communicator, flashlight with standard and UV settings, and an A/V recorder and transmitter (8 hours of record time). The visual suite of the helmet includes UV, Th, L-L, AD, TSM, and Smartlink, and the helmet is fully enclosed with an armored faceplate and visor (SP:10) with filter, can be seals around the wearers head and used as a gas mask. Finally the suit comes with an armored small backpack with a 20 minute independent air supply, in addition to standard storage space. The entire suit, which includes its own combat gloves, is thermal dampening, and acts like an IR poncho. 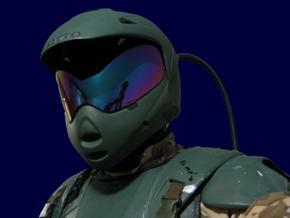 The helmet of this combat armor comes equipped with radio, Low-light, and Anti-dazzle, as well as an air filter. The real nice touch however is the Sabretech Ammo-Hopper. Available to suit any caliber. Shown is the 2000 round 9mm attached to the Norinco Thunder assault cannon (rif - +1 - na - r - 2d6 (9mm) 2000 - 30 - st 895eb). Ammo capacity varies by ammunition size, for handgun rounds 2000, for assault rifle (4.5mm - 7.62) 300, for heavy rounds (10mm - 20mm) 100. The ammo hopper can be bought seperate from the armor, and worn like any backpack at a cost of 200eb. 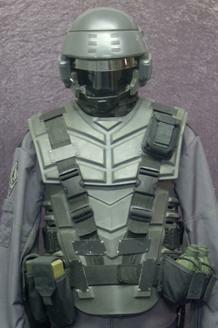 This complete suit of armor is ideal for security personnel or even light assault work. Not as good as Gasium, but not as expensive either. 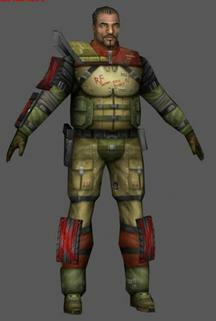 This is the armor worn by Trauma Team assault personnel and door gunners. Trauma Team got tired of having to pay insurance benefits to its employees who dropped into hot LZ's to extract the client. 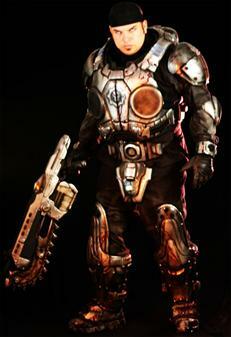 This armor allows them to shrug off any small arms fire without a sweat. 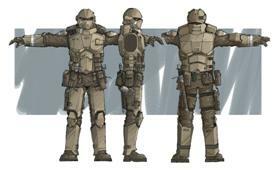 Because this armor is so heavy and so bulky, only 2 operatives per AV will be wearing it. for the torso as well as shoulders. This armor incorporates buckles for attaching load bearing straps directly to the armor, the straps attach at the shoulders and hook to the heavy belt of the soldier. Features separated plates on the back to protect the neck, and features a video camera w/ 2 hours recording time and detachable short range radio and a built in fold down optic with Low light and Thermograph installed. The radio headset is often worn even if the helmet isn't, providing the necessary communications in any situation. Featuring a full faceplate and visor equipped with Low Light, Thermograph, Image Enhancement, Time Square Marquee, UV, and Anti-dazzle, this system is state of the art. The helmet also features the same removable headset, and is equipped with Level Dampeners, video/audio recorder, and headlamp. An independent air supply, easily attachable to the standard torso mounting brackets completes the package. The helmet seals airtight around the wearers neck secure enough to dive 30 feet, a special collar allows greater depths to be reached and makes the helmet safe to wear in a vacuum. With less than six months since its introduction, supplies are limited and it is most often issued in situations wear gas or biological attack is expected. This torso plate is actually built into the support for the gyro stabilization mount for the heavy machine gun. It doesn't cover as much area as the standard armor, and slightly more constraining, but it does offer a bit more protection for the areas it does cover with thicker, more rigid armor. The built in gyro-stabilization mount can accept virtually any heavy machine gun, but is most often used with the MILITECH M71B3HB or a Browning M2HB. Some soldiers have complained that in addition to carrying the big gun that makes them a target, the lesser protection is injury to insult. Rave armor from Urbantech isn't really that effective at stopping bullets, but it does help Street Samurai on a budget at least look like they have some protection. It really consists of nothing more than SP:10 shoulder pads which can be attached to any heavy leather jacket and sold for 230eb. 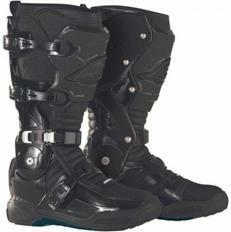 The Rave boots, sold for 690eb a pair, on the other hand, also with an armor rating of SP:10, are well respected, since they protect the entire lower leg from the kneecaps down, front and back, with out sacrificing movement. (Created and written by Deric Bernier, images from Deric Bernier, Appleseed, Cyberpunk 2077, Macross, Masamune Shirow, Gundam, Dirty Pair, Dark Minds, Men In Black, American Flagg, Aliens: Colonial Marines, Deathwish, Deathstroke the Terminator, Starman, Kite, Space:Above and Beyond, Star Wars, Ice Pirates, Akira, Backlash, Babylon 5, Burn Up W, Dave Dorman, DS9, Dream Wave, Neon Cyber, Earth 2, Grendel: Devils Legacy, Hardboiled, Nausicaa, Secret Of Blue Water, Negative One, Punisher: Big Nothing, Runaway, L-gaim, Layzner, Ghost In The Shell, Catwoman, Titan AE, Wildcats, Stark Future, Total Recall 2070, Windaria, Rifts, Gurps, Trigun, Alien series, No Escape, Akira, Killzone, Firefly, Doom, Bubblegum Crash, Humanoid, Punishers Armory, Halo, Alien Legacy, The 5th Element, Time Cop, Shadowrun, Tomb Raider, Equilibrium, Intron Depot, Final Fantasy, Hellsing, Parasite Dolls, Bubblegum Crisis, Kappowwe Toys, Gungrave, AD Police, Bubbleguim Crisis 2040, Grimjack, Project Snowblind, Bubblegum Crisis, S.I.N., Dirty Pair, Gundam, Doom, Gasaraki, Blue Gender, Hellboy, Blade series, Escape from New York, Escape from L.A., Eatman, G.I.T.S. 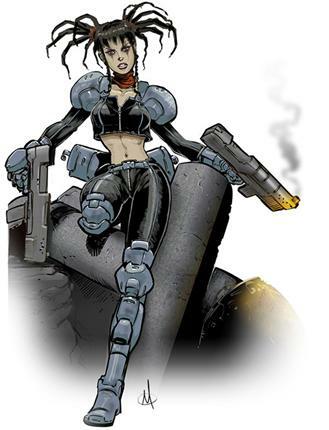 : Stand Alone Complex, Jon Sable: Freelance, I Robot, Nomad, Mystery Men, D20 Future, D20 Apocalypse, Deadlands: Hell On Earth, Car Wars, Demolition Man, Fortress, Iria Zieriam, Natural City, Space, Above and Beyond, Stealth, Unreal Tournament, Moonwalker, Gunm, Southern Cross, Grifter, Battle Lords, Lensman, SeaQuest, Robocop, Aspen, Homeboys, Judge Dredd, Terminator: Burning Earth, Edison Giacotolli, Vortex, Soldier, Back To The Future II, Echo, Event Horizon, Starship Troopers, The Saint, Robotech: Sentinels, Deathlock, Hunter, Black Ops, James Bond, Death's Head, X-Men, Firearm, Nick Fury: Agent Of Shield, Dirty Pair: Flash, Silent Mobius, Mafia Wars, Army Of Two, Capcom, Hitman, Fatal Fury, Street Fighter, Deus Ex, Quake, Air Gear, Btoom, Tekken, Perfect Dark, Fallout, Bouncer, Frontlines, Crysis, District 9, Zatoichi, Bleach, Blame, The Rundown, Avengers, Green Arrow, GI-Joe, Call Of Duty, Brink, Doom, Eon Flux, Haze, Poseidon Arms, Nerf, Starhawk, Bayonetta, Bionic Six, Hudson Hawk, Avatar, Command And Conquer, Wastelands, Borderlands, and other various manga, Anime, Comic book, video game, film, and RPG sources, Raben-Aas, Sharp-n-pointy, Biometal79, Phatandy, Bordon, Shimmering Sword, Vulnepro, El Pinoy, Br0uHaHaasdsada , Larkabella, licataknives, meandmunch, Devilita Andree Wallin, Fuchsiart, imDRUNKonTEA,Guilty Spark, Refrigerador, Italiener, Pascal Eggert, Josh Nizzi, Bokuman, Machine56, Kunkka, Johan Bergstrom, Slipgate Central, Dominic Marko, Francis001, platypusgreen, jimmypham, Warrenlou, flipation, digimech, molybdenum, Spoonboy, Doll Fac3, Eikochan, bakanekonei, teh dave, SC4V3NG3R, solkee, molinaro, KaranaK, genekruger, theelphin, garanum, 2ngaw, shed2602, gorrem, moyachiche, inception08, vietnguyen, rgus, archie, David Nakey, Kuroitora, aerpenium, Dead Robot, teruchan, acidburn08, Markovah, Mort Janu, MishaMoStyle, Blitz Bot, k hos, James Lemay, Gun0runner, Gneocidal Penguin, Kalor, ionen, djake, jett0, cyzrauk8, windriderx23, firestoned, anjinanhut, regis, libertyspikesv5, rimancreative, deutscherherbst, hexonal, Ryujin10, Raverunner, daisukekazama, dannortonart, bringmeasunkist, Merkaba998, tovenius, Message2god, peterku, nervousgryphon, knightwatch, Brian Rogers, tsukijin, talros, Michael Kingery, ygolochysp, Swatninja, Cyber999, marcwf, WarmGunMod, bcjfla76, bullseye breon, Carlo Arellano, Special thanks to Matsuo, Darth Brass, darcjedi, Tom_Braider, thedap, wuher_da_brewer, Capt_MarVel, Glim999, Pulseriflefan, TK513, gunnerk19, Tommin, BritNerfMogul, Tigadee, Johnson Arms, Wolverine_solo, and all the many fine prop replica builders of Mastucorp, the RPF, Nerfhaven, Nerfhq, and BBC).